You can pre-order physical and digital copies of Red Dead Redemption 2 right now. Today, the Special Edition and Ultimate Edition copies for Red Dead Redemption 2 were revealed alongside other pre-order bonuses. Gamers who pre-order a copy of Red Dead Redemption 2 will get free bonus content for the game’s story mode. One of these pieces of bonus content is War Horse, which according to Rockstar features “greater courage and stamina than the average steed.” The other piece of bonus content is the Outlaw Survival Kit which comes with items that refill various stat meters. Red Dead Redemption 2 is priced at $59.99 while the Special Edition will set you back $79.99 and the Ultimate Edition costs $99.99. All are available digitally, with digital copies offering their own bonuses in addition to the aforementioned Outlaw Survival Kit and War Horse. Digital copies also reportedly include a bundle of in-game cash which Morgan can use to buy “a weapon, some food, a handful of useful items, and ammunition,” according to Rockstar. If you’re able to pre-order a digital copy before July 31, you’ll also get a bonus in-game treasure map. Additionally, digital pre-orders of Red Dead Redemption 2 made through the PlayStation or Xbox Store will include bonus material for GTA Online in Grand Theft Auto 5 in the form of 1 million GTA$ for Special Edition pre-orders and 2 million GTA$ for Ultimate Edition pre-orders. 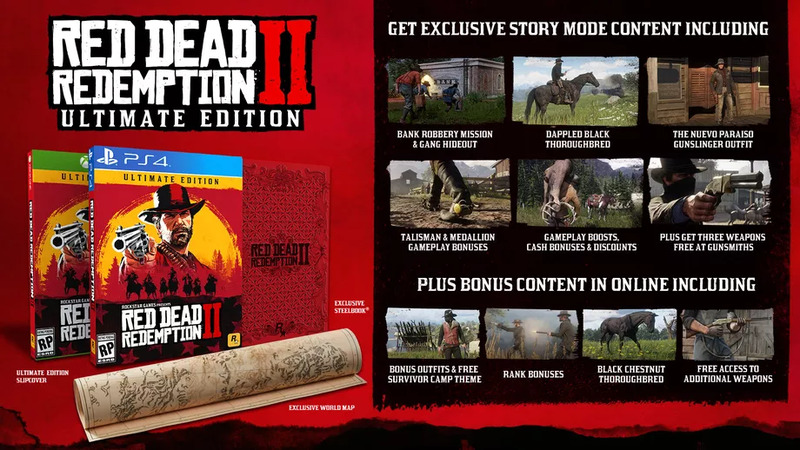 While the physical editions don’t have all of the digital pre-order content, if you’re looking for a nice map of the game’s world in general you can get one with the purchase of a physical Red Dead Redemption 2 copy. The physical version of the Ultimate Edition also comes packed in sweet looking a Steelbook case. Interested in displaying your love of Red Dead Redemption 2? 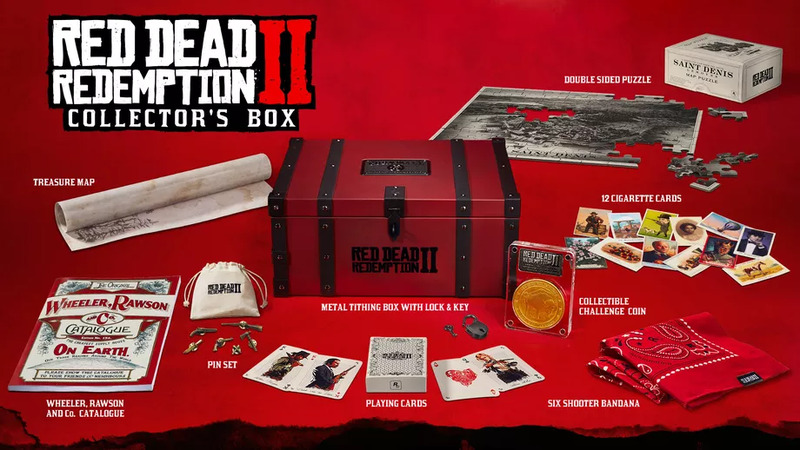 You can pick up a Red Dead Redemption 2 Collector’s Box for $99.99 which is currently available for pre-order via the Rockstar Warehouse. It doesn’t include a copy of the game and instead includes an assortment of physical goodies such a physical version of the in-game treasure map and a 100-piece wooden jigsaw puzzle that features an image of the city of Saint Denis. Other items in the Collector’s Box include a Rawson, Wheeler, and Co. Catalogue, a 150-page book replica of the one seen in the game, and all items will come packaged in a metal “tithing box” with a working lock and key. Red Dead Redemption 2 is scheduled to release on October 26 for PlayStation 4 and Xbox One. What do you think of the special editions and pre-order exclusives? Are you planning on pre-ordering a copy of Red Dead Redemption 2? Let us know down in the comments below!